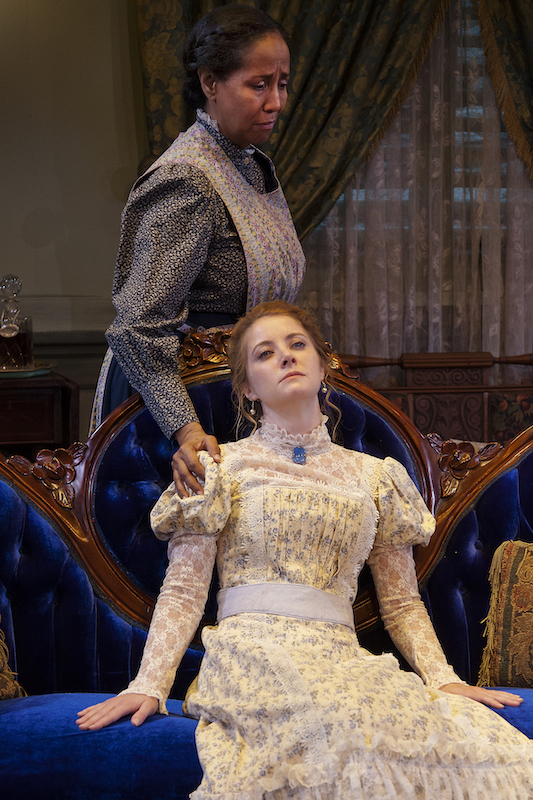 Antaeus’ The Little Foxes made an exciting move in casting Deborah Puette in the role of Regina Hubbard Giddens. Puette plays to her absolute strength in Lillian Hellman’s classic 20th century drama, set in ‘conspicuous leisure’ year 1900, (a major transition period of American history, at the dawn of the Progressive Era) by retreating from the oft robust and heady female powerhouse of this work, and instead, pulling back to a superficially nonchalant, yet patently seething femme, determined to have the freedom she wants, at any cost. The play whose title comes from Chapter 2, Verse 15 of the Song of Solomon in the King James version of the Bible, “Take us the foxes, the little foxes, that spoil the vines: for our vines have tender grapes,” focuses on Southerner Regina Hubbard Giddens, who struggles for wealth and freedom within the confines of an early 20th-century society where fathers considered only sons as their legal heirs. What Puette brings to the role that is easily overlooked is an intense vulnerability just beneath the surface which altogether, when put up against her male adversaries, for indeed they are more that than loving siblings, translates into a ruthlessly calculating counterpoint to her equally as calculating, but not-as-crafty-as-they-thought-they-were, brothers. The combination of mano versus wo-mano here by both Puette and duly surprising, Kristen Couture as daughter Alexandra Giddens, who deals the absolute check-mate finale to Regina in the throes of her triumph, brings about a stunning, on-stage, never-thought-THAT-could-happen spontaneity that makes this production as delicious at it is delicately ferocious. 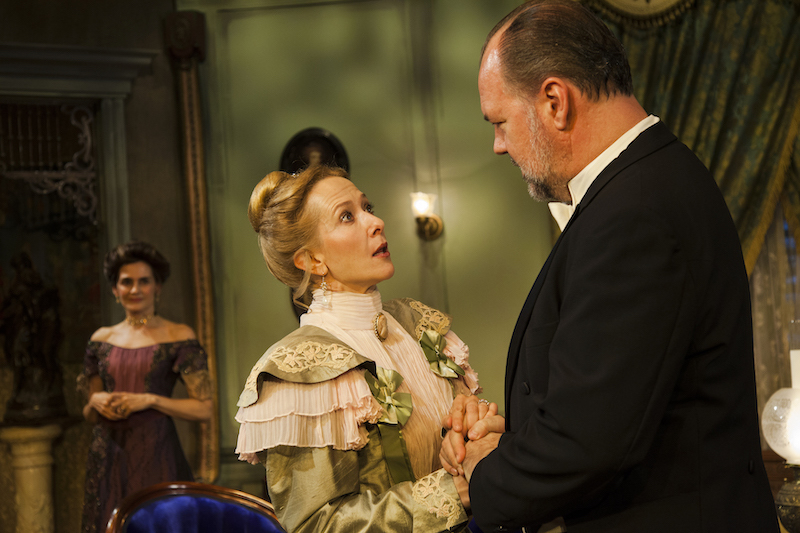 Impressive performances throughout by the entire cast most notably by Rob Nagle as Oscar Hubbard and Jocelyn Towne as wife Birdie Hubbard, whose fermented hatred and cynicism for one another foam as each respectively triumphs and falls. Town is especially agonizing here as she confesses her journey from innocence to horrific understanding in her marriage as a tool for the Hubbards to displace and destroy all that was gentile about the Golden Age into which she was born and raised. The two most poignant performances in this production however are by William L. Warren as Cal and Judy Louise Johnson as Addie. These are not mere sideline characters portraying post-Slavery era household servants. Warren and Johnson’s performances shape the relationship perspectives about all that happens within the household and stand guard to every bit of freedom, confinement, knowledge and impotence. Voices without a voice in the outside world but fierce and clear in their own domain, they are wondrously realized here by respectively both actors. There are so many breath-ceasing, head-shaking, shock & awe moments in this play that it is literally unfathomable how dark, how deep, how destructive and how hurt inflicting these people will go to have it all their way. And the cast, doesn’t ‘miss a beat’ with any of it. Magnificent is the scenic design by John Iacovelli, costume design by Terri A. Lewis and all other stage elements in the Antaeus production. Watson’s intent here is to explore the beginnings of Regina and her clan, their childhoods, their surroundings, the time in which they lived, the way they were treated, their needs and desires, their dreams, their losses, and their aching. And indeed, it is crystal clear through Watson’s breathable direction, that each of them is as analogously desperate to escape as they are to achieve in the survival-of-the-fittest “New South”. Starring Deborah Puette, Jocelyn Towne, John DeMita, Timothy Adam Venable, Mike McShae, Calvin Picous, Willian L. Warren, Judy Louise Johnson, Rob Nagle and Kristin Couture.